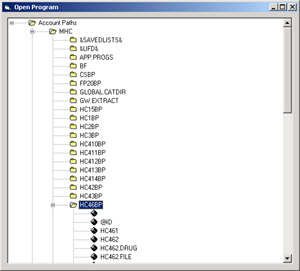 The UniEditor is a universal objects based Editor for Multivalue Database systems. For UniVerse, UniData and Pick D3. 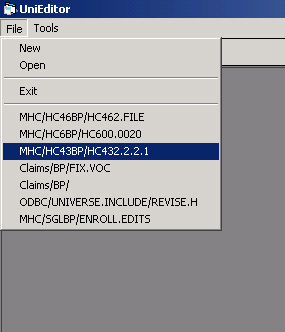 I always found the line editors that come with all multi-value databases wanting. In an SQL or Oracle environment I felt almost ashamed to be working with a line editor. Then I looked for third party tools like Ultra Edit or Text Editor, but they too were not satisfying. So I decided to write my own and also teach an excellent VB programmer, Robert Cobb, how to program with the Universe API. The UniEditor uses UniObjects, obJex, or D3Objects to access the database. Program files , which are in non hashed files are manipulated with the Sequential I/O module of Unibasic, i.e. READSEQ, WRITESEQ in UniVerse, directly with UniObjects in the case of UniData and as regular files with D3. The Editor itself is the CodeMax component by Winmain.com . This excellent editor is a piece of free software. 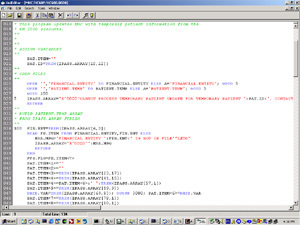 Robert's Contribution was the tie-in with Codemax as well as the part where Windows registry entries are done to track recently open programs and the defined Connections. Try the UniEditor out. If you like it, use it and have fun. I you find bugs, please report them back to me. If you make improvements or ports to other Pick flavors please share them with all by reporting them back to me.